My updates to this site have been a little slow recently and although the invariable lack of game news at this time of year is partially to blame, a little bit of responsibility has to be held by Konami. They, after all, released the Castlevania Double Pack for the GBA here last week. Ever since Circle of the Moon, a GBA launch game that really drew attention to how dark that damn screen was, Nintendo handhelds have been the systems to own for the classic 2D Castlevanias, and a great shelter from the misguided 3D ones. The Double Pack contains the second and third versions – Harmony of Dissonance and Aria of Sorrow – which are not only the best two but also, due to limited print runs, used to go for £40 each on eBay. Not anymore, when you can now get both on one cart for £25. Harmony of Dissonance was a real graphical showpiece for the GBA when it came out and it still looks decent now, with some impressive and nifty sprite effects. It’s a really good “classic” Castlevania and reasonably lengthy (took me 11 hours or so to finish with the first ending, but there are two more which I plan to get which should take another couple), but the main criticism I can have for it is that it’s very easy. I didn’t really come close to dying in the whole thing because potions are plentiful, you get fully healed at any of the many save points, and if you use spells the bosses are a simple matter of whipping and waiting until they die. Aria of Sorrow is the prequel to Dawn of Sorrow on the DS, which was a game that I really liked. While it’s still a 2D Castlevania at heart it kept many of the changes from games like Symphony of the Night by not having a Belmont at the helm (here it’s a vaguely androgynous high school student named Soma Cruz) and doing away with the whip as the only weapon. 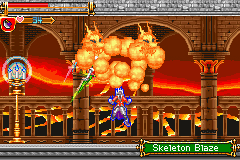 While adventuring with a variety of swords, knives, and lances, you get to use some mysterious powers that Cruz possesses and will probably have been spoiled for anyone who played Dawn of Sorrow first. Aria of Sorrow is the better of the two games, not only for having slightly more variety but also for being more of a challenge (I’ve actually died twice). The one side where it does fall down is that I don’t think it looks as good as Harmony – it seems to look a bit more cartoony and Soma’s mincing run animation is a little annoying. Nonetheless I’m a few hours in and have been very much enjoying it. The GBA has had a sudden influx of budget double packs with some good ones from Sega (the Sonic Advances and Chu Chu Rocket are worth a look), but this one takes the cake. Games that could have cost you £80 only months ago in a pack costing only £25 are an absolute bargain, and the fact that they’re two of the best on the GBA don’t hurt matters. If you have a GBA or DS and don’t own the original releases, buy this pack.